There’s no better way to culminate the boundless game viewing of your Zambian safari than a stopover in one of the best cities in the world - Cape Town. The city, flanked on all sides by the majestic Table Mountain, is a blend of cosmopolitan and laid-back charm. Cape Town is a veritable melting pot and therefore no better place to enjoy cuisine, culture and of course the rich history of the continent’s southern hub. Shopping and design lovers will enjoy Cape Town’s thriving art and commerce scene, while foodies and wine lovers will take in a wide array of gastronomic delights and nightlife. The region’s unique wildlife and climate offer a host of sightseeing and adventure activities and rare opportunities to view traditional safari game and wildlife alongside penguin colonies and seasonal whale mating and calving. Nearby Hermanus is the world’s best whale watching point, while bucolic wine country towns cradle the city. Whether your pace is shark diving, a customized wine and food tour, a hands-on animal conservation, local cultural experience or a tailored exploration through the region’s major sights, we will provide an exceptional guided foray into the bounty of Cape Town. Here are some ideas on what we can provide. These trips can be customized for the fully-guided Cape Town experience of your choice, or you can simply book partial tours to optimize your self-guided Cape Town experience. Inquire with us to create the perfect South African addition to your unparalleled safari experience. For many, a trip to South Africa wouldn’t be complete without a visit to the cosmopolitan jewel of Cape Town. Nestled below Table Mountain, Devil’s Peak and Lion’s Head, Cape Town offers a geographical and cultural extravaganza. Choose from one of our itineraries below, or contact us to customize your tour with a variety of foodie, wine, or adventure activities. Game viewing from Cape Town may also be arranged. All prices based on 4 star hotels and double occupancy. Rates for single supplements and/or 5 star hotels can be quoted upon request. Prices fluctuate based on travel daes and currency exchange rate. Please inquire here with your travel dates for the most up-to-date pricing. This can’t-miss tour makes sure you get access to all the iconic gems of Cape Town and nearby historic and picturesque coastal villages, as well as a full day wine tour of the Cape Winelands, through mountain ranges, vineyards and Cape Dutch homesteads. In the city proper, you will visit the famous Table Mountain (cable car fee not included), the Company Gardens, the South African Museum, the Castle of Good Hope and the vibrant and arty flea market, Greenmarket Square. Photographers and Instagrammers alike will love the trip through the picturesque Bo-Kaap, one of the most pictured areas of Cape Town. An awe-inspiring drive to the the Cape Peninsula is one of the world’s most scenic areas and stretches from the City Centre to Cape Point. We travel along the Atlantic Seaboard via Sea Point, Clifton and Camps Bay, stopping at a Llandudno look-out point before continuing to Hout Bay, a quaint village and fishing harbor with magnificent mountain views and beach. On through Chapman’s Peak, one of the world’s most breathtaking coastal drives, to Cape Point and the Good Hope Nature Reserve, which has magnificent fynbos vegetation, bird life, endemic antelope species and zebra, historic lighthouse and shipwrecks. Cape Point is perceived to be the meeting point of the Atlantic and Indian Oceans. On to historic Simon’s Town, a village with charming Victorian architecture, a naval base and the famous penguin colony at the beautiful Boulders Beach. Boulders Penguin Colony is home to a growing colony of the vulnerable African Penguin. Wooden walkways allow visitors to view the penguins in their natural habitat and there is also a new information centre. We then make our way to visit the well-known Kirstenbosch Botanical Gardens. The Garden is one of eight National Botanical Gardens covering five of South Africa’s six different biomes. When Kirstenbosch, the most famous of the gardens, was founded in 1913 to preserve the country's unique flora, it was the first botanical garden in the world with this ethos. The garden is world-renowned for the beauty and diversity of the Cape Flora it displays and for the magnificence of its setting against the eastern slopes of Table Mountain. And finally, a full day trip takes you to the heart of the Cape Winelands, through mountain ranges, vineyards and Cape Dutch homesteads. The heart of South Africa's wine industry – Stellenbosch - offers great beauty and culture, steeped in South African history. Walk down some of the avenues, shaded by giant oak trees and beautifully preserved historic buildings. We enjoy our first wine tasting of the day at the Waterford Estate (or similar). Travel over the Helshoogte Pass to the town of Franschhoek, historically dating back to the 17th century when the French Huguenots arrived. This charming town, in a most picturesque valley, retains a French Huguenot style. We enjoy a wine tasting before stopping for lunch. Onward to Paarl, one of the Cape’s first farming districts. The town is set at the foot of the cluster of remarkable granite domes from which it takes its name. Our last stop for the day is at a wine estate on the Paarl wine route. We return to the bustle of city life after an enthralling day in the countryside, arriving back at the hotel in time for a free evening before next day’s departure. Enjoy all the major elements of our Classic Cape Town itinerary, but luxuriate for two nights accommodation on a picturesque wine estate in Cape Winelands, along with a customized and private (small vehicle) day-long wine tour in the region's renowned vineyards, farmhouses and gardens. 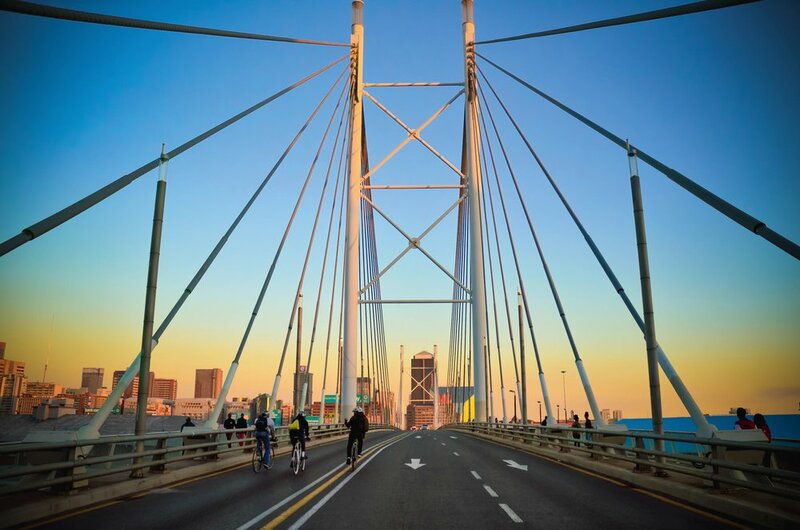 Savor the sights and sounds of Cape Town from the back of your trusty bike, with a guide behind you every pedal of the way! Photography lovers will also enjoy this active, fully supported tour. Guides are experienced, and all cycling gear is included. Highlights include historic V&A Waterfront as evening descends on the city. Cycle along Beach Road as waves lap up on the shore, with the iconic Green Point Stadium beside you. Idle through the Company Gardens, home to Parliament, the National Gallery and much more! Soak up the bars and cafes on Long Street before the smell of Malay curry fills the air in Bo-Kaap with its mosques and colored houses. Return to the exclusive Waterfront Marina Yacht Basin for a glass of sparkling wine and gourmet canapes at the famous Bascule Bar, as the sun sinks below Table Mountain! A one-day visit to South Africa’s largest township, Khayelitsha, will begin at a cycling academy which gives children from this community a chance to be engaged after school hours. We stop at Lookout Hill and climb to the top of this panoramic viewpoint before visiting an informal settlement comprised of tin shack dwellings. Continue past the train station, local shopping centre, spaza shops selling groceries, home styled hairdressers and many more fascinating sights and sounds.